Exploration of Medieval, Renaissance and Baroque harp repertoire along with performance practice research is a passion for native Texan, Becky Baxter. Her modern harp studies began with Beatrice Rose, 35-year veteran harpist with the Houston Symphony (now retired.) 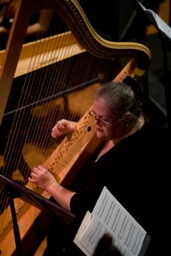 Ms. Baxter’s harp studies and career began during her undergraduate studies at the University of Houston while she simultaneously obtained her bachelor’s degree in organ performance. She continued studies at the Shepherd School of Music but her greatest inspirations in early music came from her studies in Milan, Italy under harp teacher, Mara Galassi. Ms. Baxter has recorded on the Dorian and Naxos recording labels as a soloist and with groups such as Chatham Baroque and Catacoustic Consort. In addition to touring for concerts and teaching at workshops all over the nation, she loves being a part of the thriving early music scene performing with Ars Lyrica, Camerata Ventapane and Mercury Baroque in Houston, her home of over 50 years. Ms. Baxter regularly performs with Texas Early Music Project in Austin and teaches at workshops sponsored by the Texas Early Music Festival (aka “The Texas Toot”). Ms. Baxter also currently serves as music director at All Saints Episcopal Church in Stafford, Texas.